It was my son’s high school graduation yesterday and I was ready, at least gear wise. The ceremony was held at a large multi-purpose indoor arena, and as expected, the lighting wasn’t particularly great for photography. Purely by luck, Precision Camera’s bi-annual camera expo was going on. Charles, the regional Olympus rep, was in town and he was nice enough to loan me some special lenses for several hours. The two giant pro lenses on the right are his handiwork. The slightly smaller one is the 40-150mm f2.8 Pro. The larger, the 300mm f4 Pro. Both look even more impressive with their built-in lens hoods extended. On the left, my two Olympus cameras. They’ve been my go to setup this year. The black camera is my Olympus OM-D E-M5 Mark II with optional grip and attached is the 12-40mm f2.8 Pro. The silver camera is the Olympus PEN-F with the 75mm f1.8. The venue had a size limit for incoming bags, with could not exceed 12 inches in any dimension. Fortunately, my old Crumpler “Six Million Dollar Home” camera bag worked perfectly, measuring in at 12 inches x 9 inches x 7 inches. Amazingly, everything fit in this relatively small bag. I basically brought everything shown here, plus the 1.4x extender that Charles also recommended. Though the 75mm would have fit, I opted for the smaller 17mm f1.8 instead. In reality, I just used the 17mm, as a fancy lens cap, since I attached the big lenses on the PEN-F. I like the Olympus gear for its small size, usually shooting with prime lenses. In fact, the 12-40mm Pro is one of my heaviest lenses. But the micro 4/3 sensor also helps when shooting long. 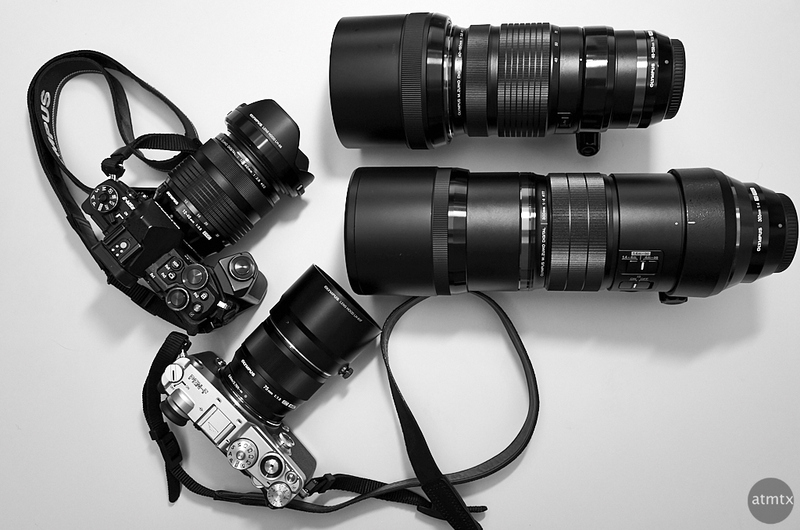 Yes, even if these pro telephoto lens are comparably large, they are incredibly small compared to full frame. Just think, in that small Crumper bag, I had two camera bodies with lenses that shoot at f2.8 from 24mm to 300mm equivalent. With the 1.4x extender, I could go to 420mm at f4. Plus, the biggest lens allowed me to shoot at a 600mm equivalent at f4. Throw in the extender and I have 840mm at f5.6. Because of the size restriction at the venue, I would not be able to bring a comparable setup in any other interchangeable system. Hi, sounds like the good planning worked out.Which camera and lens Did you end up using the most? Cheers. Hi Justin, my most used combo was the PEN-F with the 40-150 f2.8 lens. You must have a better example of that lens than mine. I’m actually quite disappointed. I love love love my 12-40 ƒ2.8, but the big telephoto seems a little soft. I’ve got another lens that performs every bit as well, and it’s about a quarter the size: my Canon EF-M 55-200mm, which fits on my teeny tiney Eos M6. Sorry to hear that, Skyring. I only had a chance to use the lens for a couple of hours so I didn’t have time to do extensive testing. The center, where I focused seems sharp, but I can’t confirm sharpness across the enter field. I own the Olympus equivalent of the Canon 55-250mm. Those lenses are compact and sharp since their smaller apertures make them technically less demanding. My challenge was getting as much light as possible because the venue wasn’t that bright.